After the Ethiopian Peoples’ Revolutionary Democratic Front (EPRDF) assumed power in 1991, the Sidama nation was granted regional self-administration. This proved to be short-lived. Five districts of the south were then merged together without due consultation to construct the Southern Nations Nationalities and Peoples’ Regional State (SNNPRS). However, the constitution provides the right to statehood, and the Sidama have since made a persistent request to exercise that right, as an integral part of their struggle for self-determination. Sidama elders and scholars tell of an experience within Ethiopia of repression and discrimination. The memory is fresh of the May 24, 2002 Looqe massacre by regional police and federal troops of Sidama citizens demonstrating against the denial of constitutional rights. Nobody was held accountable. Following that dark day, repression was frequent. Now, after a campaign led by young Ejjeetto campaigners and others, the people are on the verge of writing a new chapter in their history. In July, the Sidama Zone council unanimously approved a statehood request for the second time. The first was in 2005, which the federal government blocked. After brief deliberation, the SNNPRS council endorsed the Zone’s recent decision and, due to its own lack of capacity, requested for the National Electoral Board of Ethiopia (NEBE) to organize a referendum. However, since then, there has been a deafening silence. Due it seems to political intervention, the referendum has not been organized. Once the decision is made, a referendum should be scheduled within a year. If the referendum confirms the statehood demand, the likely outcome, then Sidama automatically becomes the tenth state of the federation, necessitating an informal constitutional amendment. But NEBE has not yet set a date for the referendum. Six months have passed and there have not even been any official pronouncements. We know change is taking place at the board, including the installment of former opposition leader Birtukan Mideksa as chairperson, but does that mean it is unable to announce at least a tentative date for the referendum. Another issue is the new Administrative Boundaries and Identity Issues Commission. Recently, when the Prime Minister discussed with teachers, he said that the commission will address issues including the question of statehood. However, the Sidama have not presented any boundary claims to state organs. The Commission’s mandate therefore does not concern the Sidama statehood process. Some have argued that statehood requests by nations like Wolayta, Keffa and Gurage create a challenge for the Sidama demand. However, such arguments do not consider that the Sidama request is a constitutional question in its own right, and so other similar claims are strictly irrelevant. Furthermore, the Sidama campaign has positive implications for the other demands. The constitution says: “states shall be delimited on the basis of the settlement patterns, language, identity and consent of the people concerned”. SNNPRS was not delimited on this basis, so it is time for it to be dismantled. Sidama will therefore set a precedent that will be useful for the other southern nations. Recently in Hawassa there has been anger at the latest report of the Ethiopian Human Rights Council (HRCO). That is because a seemingly biased account was perceived to be an attempt to undermine Sidama self-determination efforts. Former Sidama Development Corporation Director, Dr. Wolassa Lawisso wrote that ERCO did not live up it ethos of defending the rights of all citizens impartially. In its report on the unrest in Sidama Zone in June, it presented a “partisan” anti-Sidama narrative, he argued. Last year’s conflict involving Wolayta and Sidama was tragic and destructive. But apart from this incident, the Sidama have accommodated the Wolayta and other groups, although there are concerns that Wolayta politicians, activists and scholars have been used to criticize the Sidama statehood request. Sometime also the regime has tried to hoodwink the people by installing handpicked Sidama cadres to do its dirty work at regional and zonal levels. For instance, there is a suspicion that EPRDF operatives worked to divide activists and clan leaders. Some claim these people have also been creating conflict between the Sidama and surrounding Oromo communities. Plan government institutions and structure, and assign officials accordingly. The Sidama struggle for political and economic equality in Ethiopia has been around a long time. The repeated denial of the right to self-administration is one of the driving forces uniting the Ejeetto and others segments of society, shaping and reinforcing their nationalism and national identity. The Sidama youth and freedom fighters can be the owners of their destiny by rejecting all forms of injustice. The importance of the Ejeetto should not be underemphasized. 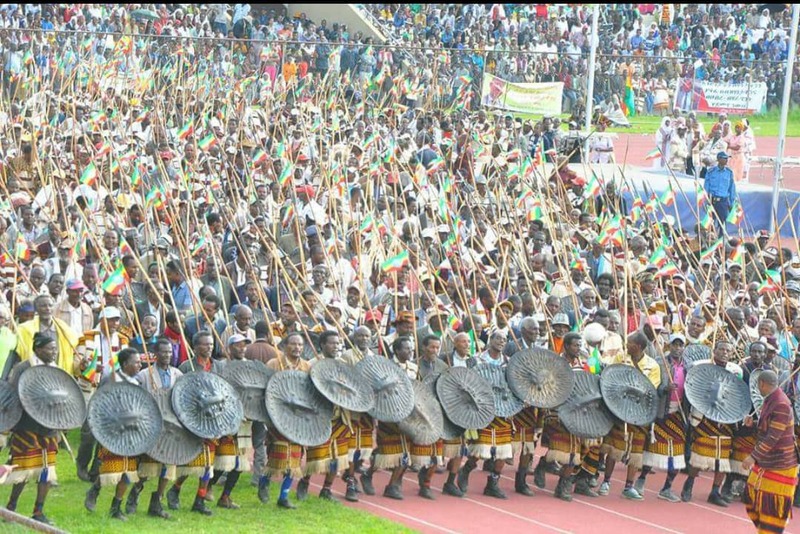 The youth can promote the image of the Sidama nation and present its concern to national and international bodies. Although they experienced repeated setbacks, the Ejeetto must keep pushing for better governance and for the rule of law, in Sidama and beyond. And they must keep pushing for respect of their constitutional rights until the Sidama nation is managing its own resources and its own affairs. Ultimately, of this we can be sure: the Sidama quest for self-administration is legally, morally and politically strong, and it will continue with bravery and unity for generations until the goal is reached. Addis Standard reports that a boiler exploded in Debub University. Engineer inadvertently touched the untouchable boiler filled with explosive gases. It also reports that Kushitic firefighters borrowed from Oromia Fire House dowsed the flame and killed it for good. SNNPRS was mechanically assembled to fit TPLF’s ambition of control and plunder. TPLF used individual Sidamas in doing so. These individuals served TPLF interest, not interest of Sidama people. Sidama people deserve their own state. We will stand with you. Long live Sidama-Oromo fraternity. Sidama was also an enthusiastic supporter of the military dictatorship of murderer Mengistu Hailemariam. Sidama is no full. It does what it does for money and power to use it in favor of itself. I wonder why sidama self-determination quest took so long to be accepted and implemented. You gave us a clear understanding Yohanan I will look forward to hear more about the sidama referendum process. SNNPR looks like the kingdom of Sidam. Since its arbitrary creation, it has been ruled, largely, by Sidamas. And cultivated and maintained hostile posture toward the neighboring ethnic groups it ruled such as Welaita, Gurage and Hadiya. What, in fact, bothers Sidama to behave so predictively violent towards the groups it rules, from whom it wants to separate and from whom it could have gotten peer support for its autonomous statehood? It has a problem with the TPLF its supports, let it sort it out. No matter what Sidama should not weaponize and militarize its youth against non-Sidama residents of the zone. They do not hold it from separating from SNNPR but rather support. It’s like a fool shooting their own feet.